200g Zeolite provide 66 servings. It is the ideal size for a one month detox for one person providing you with approx. 6g Zeolite daily. NZeolite is nature's most potent mineral detoxification aid with a unique crystalline structure that can bind, trap and remove toxins from the body. 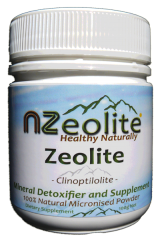 NZeolite is a natural mineral complex with a high amount of silica and 71 other minerals and trace elements that may assist in restoring the body's pH balance, support the immune system, cleanse and detoxify the intestinal tract, and assist healthy bowel function. NZeolite can be used in many different ways, including cleansing facial masks and mud baths. Please click here for further info about the different uses of NZeolite.